So let’s discuss about Add-ons. 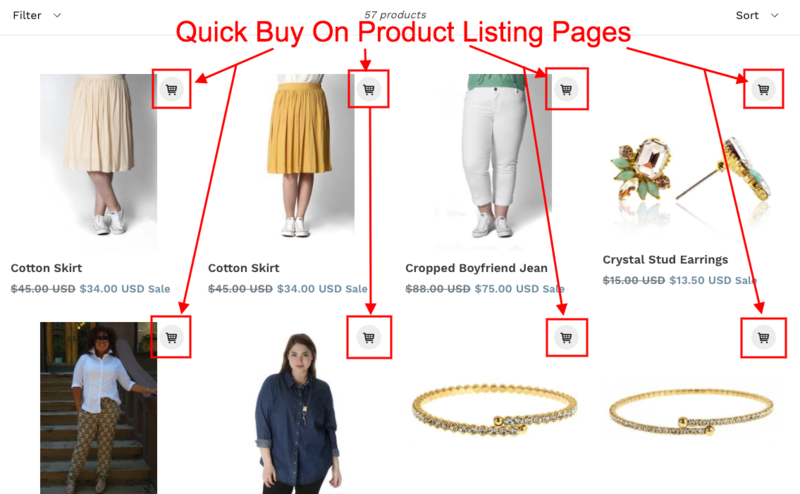 This is Quick Buy On Product Listing Pages Add-on. This is really helpful for your customers as Quick Buy On Product Listing Pages will display small Cart icon in every products on Product Listing pages like Home page, Collection pages, Recommended Products Listing etc. Your customers will able to click on Cart Icon and able to directly add product to Cart page without going to Product page. This will reduce your cart abandoned ratio and redirect your customers to Cart page or Checkout page. Let’s discuss all options one by one. Desktop and Mobile Enable option: This is two switches for Desktop and Mobile enable for Quick Buy On Product Listing Pages option only. So there are many cases where Merchant(store owner) want to display Quick Buy On Product Listing Pages option in Desktop only or Mobile only. So just uncheck box where you don’t want to display Quick Buy On Product Listing Pages Add-on. Quick Buy Position: You are able to choose where you want to display Quick Buy On Product Listing Pages Add-on in your store. There are two positions where you are able to display that includes Top Left and Top Right. When Quick Buy is clicked, Add product to cart and: This option let’s you allow to choose where should your customers will go after they will click on Quick Buy Cart icon. There are three options for this. Stay on same page, Go to cart and Go to checkout. Stay on same page will allow your customers to stay on same page and product will add to cart so they will able to choose more products from same page. Go to cart will redirect your customers to Cart page once they will click on Quick Buy Cart icon and product will be added to cart. Go to checkout will redirect your customers to checkout page and skip cart page, Go to checkout will sometime reduce Cart abandon. But it’s not good if you are using any Shopify Discount Apps that provide discounts at Cart page for example Special Offers By Shoptrade, Inc. Shopify app, Ultimate Special Offers Shopify app etc. If you are not sure please chat with us or email us from in app chat widget. But don’t worries for your Discount codes that you have generated from Shopify Admin as it’s always apply from Checkout page directly. Quick Buy Cart Icon Color: You are able to choose which color you want for your Quick Buy Cart Icon. There will be Color Picker for that. Quick Buy Me Background Color: You are able to choose which color you want as Quick Buy Cart Background for your Quick Buy Cart Icon. There will be Color Picker for that. Quantity Selection: Your customer will able to select number of quantities for your products when they are adding products using Quick Buy On Product Listing pages. By default this feature is disable and you are able to enable/disable it anytime by going Buy Me app -> Quick Buy On Product Listing Pages Tab -> Quantity section. Choose Cart Buy Icon: We have list of Cart Icons from that you are able to choose whichever fit into your store Cart Icon. If you think we are missing any Cart icon please guide us and we will include that for you. This entry was posted in Buy Me. © 2019 MakeProSimp. All Rights Reserved.